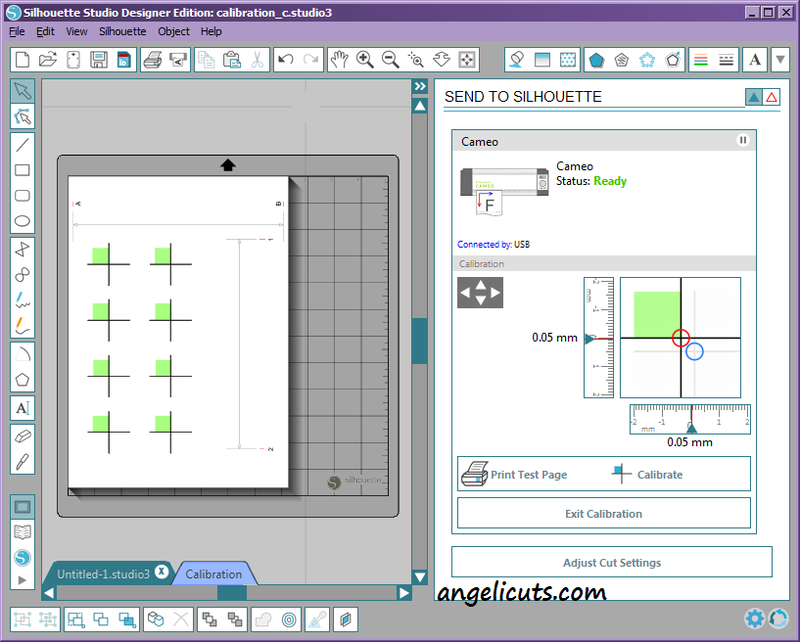 In Silhouette Studio V3, the ability to calibrate your machine’s Print-and-Cut accuracy has been moved out of sight! I had to look in the manual to find out where they hid it. I was flabbergasted by the answer and now you can be too! Turn on your Silhouette Cameo or Portrait. Click the icon at the top most right called, “Send to Silhouette”. It looks like a Cameo with some material sticking out that has a sideways A on it. It turns into a downward arrow after you have clicked it. In the box that lists your machine, right click and a list of options will come up: Release Cameo (or Portrait), Connect to Cameo (or Portrait), Calibration, Distance Adjustment, Manual Registration, and Automatic Registration. Choose Calibration and it will come up with the Calibration test page and settings. It looks stylistically a little different from V2, but the functionality is the same. You can now proceed with my previous tutorial on how to calibrate your machine! The subtitle to this should be: A Cautionary Tale! How I Broke My Cameo, But Then Fixed It. You see, I have lots of Print-and-Cut projects that I want to do, but I wanted to calibrate my Cameo to ensure that the cuts were as accurate as possible. I headed over to the official website for support on how to do the calibration. I didn’t understand the instructions very well, but I forged on anyway. I shouldn’t have! Long story short, I ended up making my Cameo cut parallelograms instead of squares, but I fixed it. So, of course, now I have to share my newly found knowledge to help you not make the same mistakes as me! You have made sure you’ve done all other things necessary for Print-and-Cut correctly. Registration marks are checked to show on your paper. 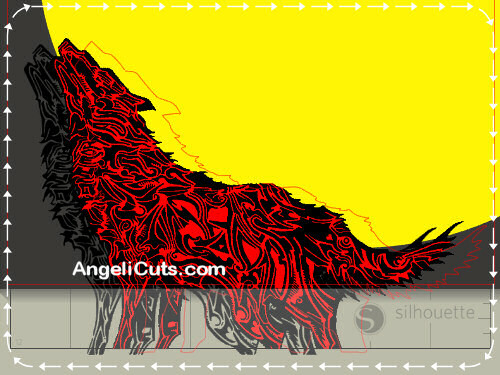 Your design is not in the areas that cannot be cut in during a Print-and-Cut. You’ve placed your paper onto the cutting mat the same way as shown in Silhouette Studio. You’ve loaded the cutting mat with proper alignment to the rollers and chose the correct load option. The distance that the cut is off is the same across the paper. If it is 2cm off on the far left side, but only 1cm on the far right side, Silhouette America recommends that you don’t calibrate. If you meet these two requirements, you may proceed to the instructions! WARNING: Do not attempt to do this while you are distracted. Do not attempt if you’re not willing to read all the instructions before starting. You can break your machine’s ability to do Print-and-Cuts if not careful!! I have taken a screenshot of the calibration window and made some notes on it and symbols that I will refer to in the instructions. This screenshot was taken in V2.8.16, but V3.1.417 looks very similar. Turn your Cameo or Portrait on. *I normally have a thickness of 15 for my card stock, so I lowered the thickness down to 10. This will make the paper easier to remove later and allow you to make double cuts. Go to File->Calibration. What I have shown in the screenshot will appear. Print the Calibration Test Page with your card stock. 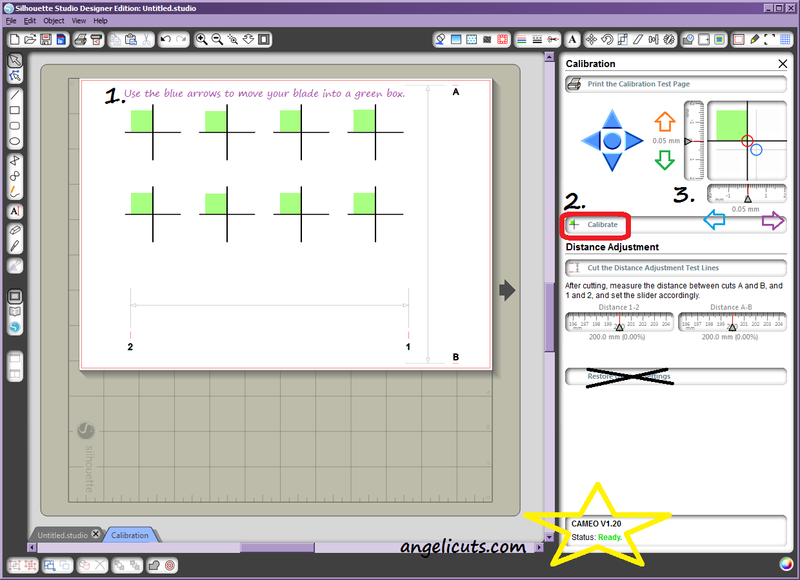 Place the printed out test page on your cutting mat as shown in Silhouette Studio. On your Cameo/Portrait, use the arrow keys to choose Load Cutting Mat, align your cutting mat against the machine’s rollers, and press the Enter key. Watch the area that I have starred in the screenshot. Notice that when you press “Calibrate”, it goes from “Ready” to “Working”. This is important. Unload your cutting mat from your Cameo/Portrait. Starting with the horizontal test line, use a ruler to measure the distance in millimeters between the cut line to the the middle of the test line and write it down. The calibration will accept as small as a .05 millimeter change for V2. If the cut line is closer to the orange arrow in my screenshot, your measurement will be positive. If the cut line is closer to the green arrow in my screenshot, your measurement will be negative. Now with the vertical test line, use a ruler to measure the distance in millimeters between the cut line to the the middle of the test line and write it down. If the cut line is closer to the blue arrow in my screenshot, your measurement will be positive. If the cut line is closer to the purple arrow in my screenshot, your measurement will be negative. Reload your cutting mat into your Cameo/Portrait. In Silhouette Studio, use the blue arrows to move your blade to the next green box. Click Calibrate and after the cut is complete, click and drag the arrows in the area of Silhouette Studio that I have marked as 3. in my screenshot. This is time sensitive! You need to do this while the Status is still “Working”! If Silhouette Studio reverts your adjustment back to what it was before, it was not accepted and so your calibration has not been changed. Wait until the Status says “Ready” and try to Calibrate again. Move your blade to a new green box first, if needed. Once Silhouette Studio has accepted your adjustments, you can press the X to exit the calibration. You should do a test Print-and-Cut to try out your new calibration settings. You can use the one that I made. Download it here. If you have done the calibration correctly, the Print-and-Cut test should be perfect or very, very close! I recently had to reinstall Windows 7 64-bit, so I thought I would write out what I did to install multiple versions of Silhouette Studio on the same computer. Special steps are needed to keep the different versions; otherwise the newer versions of Silhouette Studio will delete the older ones. Silhouette America has the legacy version 2.9.45 and the current version, 3.0.531 3.1.417, is available on their website here. If you still have the CD that came with your Cameo, it should have version 2.0.0 on it. The Portrait CD should have a later version of V2 on it. *You may need to set hidden files to be shown to see the “ProgramData” folder by clicking Organize in Windows Explorer and choosing “Folder and Search Options”. In the View tab, click the circle for “Show hidden files, folders, and drives”, click Apply, and then OK.
Alternatively, you may find the folders in the C:\Documents and Settings\All Users\Application Data\ folder instead. If you still can’t find the folder, do a file search for “com.aspexsoftware.Silhouette_Studio” in your main drive (typically “C”). Uninstall the existing Silhouette Studio. Install the oldest version of Silhouette Studio that you want. Uncheck “Run Program” and exit the installer when it is finished. Make a shortcut on your desktop to this version by right-clicking on the executable and choose Send to->Desktop (Create Shortcut). Install the next version by repeating 1-4 with the appropriate version number for the naming. Restore your backups back to the appropriate folder listed in part 1. *Every version will be affected by this change, so you only have to do it once! Optional step: Clean up the shortcut names on your desktop and change the icons to help differentiate between the versions. *In my experience, Silhouette Studio V3 somehow breaks the license files. If you open V3 and then later open V1 or V2, you will not have Designer Edition enabled. The only fix I currently know for this is to copy your backup back over after using V3. I will be looking into a true fix for this. As of August 4th, 2014, this is no longer true. The newest release of Silhouette Studio V3.1.417 has fixed this issue. If you registered your designer edition in V2, it will show up in V3. Want to uninstall one of the versions? If you look in Program and Features in the Control Panel, you’ll notice only one version of Silhouette Studio is shown as installed. It is the most recent one you’ve installed. To uninstall one of the other versions, delete the folder from Program Files x86 and the corresponding shortcut from the desktop. 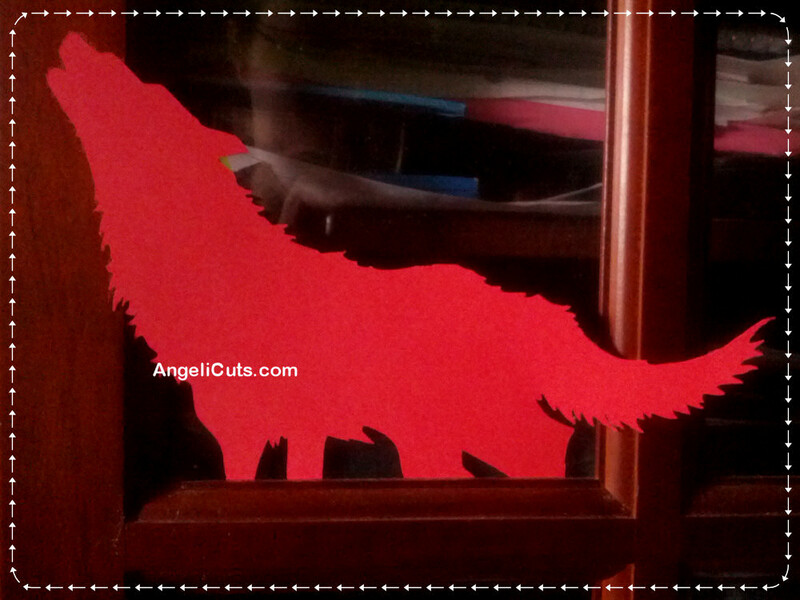 I saw this wolf and thought that it’d be awesome if I could clean it up and make something for my husband with it. The cleaning process in Paint.Net wasn’t that bad, but I think I could have done a better job. I ended up shredding several pieces and shedding some internal tears over getting the intricate design to be cut. The blade that came with my Portrait hates acute angles and tears up the 65lb paper that I’ve been using. I tried all the tips for improving it, but none worked. The end result was a simple cut out. I’m waiting on my 60° blades and thicker paper before I try the intricate part again.